Catherine Ann (Willis) Hybert, 52, of Englewood, Catherine Ann (Willis) Hybert of Englewood, Colorado, went to live with our heavenly father on December 17th, 2013. Funeral services will be held December 28th, 2013, at 10:00 o'clock A.M. at Sunset Memorial Gardens & Funeral Home with Reverend Dr. Byron McWilliams and Reverend Curtis Brewer officiating. Burial will follow at Sunset Cemetery. Cathy was born in Odessa, Texas, to Palmer and Ann Willis on June 29th, 1961. 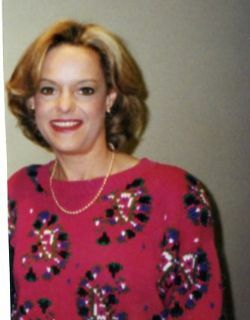 Cathy graduated from Permian High School in 1979, where she was a member of the Permian Band and Orchestra, the National Honor Society and various clubs. Cathy loved her church and stayed involved in many activities. She graduated from the University of Texas in Austin with an accounting degree and went on to be an accountant in several firms. She was a member of the Kappa Sorority and was involved in several religious organizations. Cathy is preceded in death by her father, Palmer Willis, and grandparents, Mr. and Mrs. Wesley Barnes, Mr. and Mrs. J.J. Willis. Cathy is survived by her mother, Ann Willis, children, Julie Watters and husband Joel Watters of Silver Springs, Md., Matthew Moseley and wife Bree of San Jose, California, Mary Moseley of Silver Springs, Md., Abbey Moseley of Nashville, Tenn., a sister, Susan Bryans and husband Mark Bryans of Dallas, TX. Nieces and Nephews are Lauren and Thomas Bufkin, Lindsay Gray, Emily Gray, Jo Anna Bryans and Jake Bryans. Aunts and Uncles are Bill and Janice Barnes and Kelli of Haslett, TX, Fred and Wanda Willis of Lampasas, TX, Sara and Russ Herrington of Odessa, TX, Joe Willis of Lampasas, and a number of cousins. Memorials may be given to First Baptist Church Music Dept., Library and Building Fund, or memorials of your choice. Many thanks and appreciation to family and friends for their love and caring concern. Services are under the direction of Sunset Memorial Gardens and Funeral Home. Online condolences may be made at www.sunsetodessa.com. Click here to see Catherine's last Profile entry.